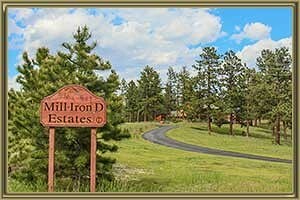 Mill Iron D Estates a highly sought after, quaint community with 88 homes located off Highway 285 and County Road 43A in Bailey. At elevations of 8300-8500 feet, most properties feature custom ranch or 2-story homes. Typical floor plans range from 2000-5000 square feet and sit on 2 ½ -5 acre flat landscaped yards the homeowners love and maintain. Located in the Foothills and close to world class skiing, homes in Mill Iron D Estates were founded in the early 80’s and expanded until 2010. Many homes for sale in Mill Iron D Estates have 2-3 car garages, walkout basements and decks for views of the mountains where eagles, owls, hawks, deer and elk can be observed in their habitat. There is a homeowners association known as the Mill Iron D Estates HOA. Check out this subdivision for upscale home options in Bailey. For the avid golfer close by is Red Rocks Country Club, Evergreen Golf Course and Hiwan Golf Club. If you are looking for outdoor activities check out Staunton State Park, Deer Creek Valley Ranch and Wellington Lake for hiking, biking or a picnic with the family. See what your home is worth With an Instant Home Valuation Online. Want advice on selling your house? We provide a free staging consultation, pre-listing prep plan, and a Mill Iron D Estates real estate market analysis. Call us at 303-325-5690 to learn more. New to the Area? Call our Mill Iron D Estates real estate agent at 303-325-5690 to schedule your tour of Homes in Bailey CO.